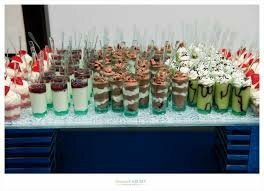 Customer is responsible for fruit garnish, ice, plastic cups, straws. Upgrade package with glassware and flower garnish. Upgrade package to real pineapple and coconut cups. We can supply those items for additional cost. It takes time and skill to hollow out pineapple and coconuts. Picture for reference only from one of our high end displays.